Ladies and gentlemen of the jury, everyone is familiar with the tired cliches: women are bad drivers and are not good with money; only guys play video games and they give bad directions. Dan Abrams tackles the toughest case of his career in Man Down. 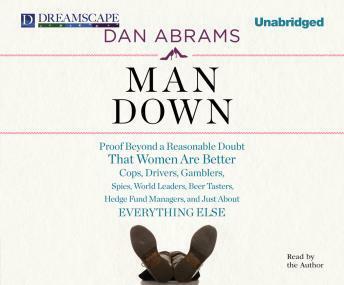 Drawing on years of legal experience and research studies, Abrams explains step-by-step why women are better than men in just about every way imaginable, from managing money to flying planes to living longer. Abrams uses his trademark charm to get his point across without opining on the issue himself. Chock-full of fun facts and conversation starters, this book may not end the debate of men versus women, but it will definitely make it more interesting.